The U.S. Army has begun to field-test a new Army Combat Fitness Test. That's the core of its fitness program, and it replaces a regimen that has been used since 1980 when running shoes were just being introduced and soldiers did their workouts in boots. The program, which entered its test phase in October 2018, has been brought up to date with changes in physical fitness training methods. It also better addresses the modern Army's needs: This test is gender-neutral and age-neutral. The revamped version is expected to be fully implemented in October 2020, possibly with changes based on feedback from the soldiers involved in the test phase. The only component that remains the same is the last exercise: a two-mile run. The new test consists of six tasks of "events," rather than the three in the previous test. The test scoring system is still preliminary, but for the test 100 points is the maximum score, and 60 points is the minimum passing score. The standards may vary, however, depending on the occupational specialty or unit of the test subject. Currently, the Army is considering classifying the physical demands of its various occupations as "heavy," "significant," or "moderate." Thus, an infantryman would be in the "heavy" physical demand category, while a helicopter pilot would have a "significant" physical challenge. At least during the test phase, the minimum requirement for a soldier in a "heavy" demand category would involve a 180-pound deadlift, an 8.5-meter power throw and 30 pushups. But a soldier whose job is considered only moderately physically challenging would have to lift only 140 pounds, demonstrate a 4.6-meter power throw and finish 10 release push-ups. 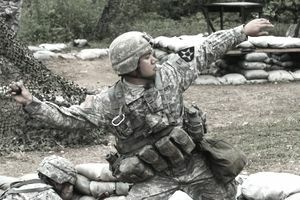 Lt. Col. Jeffrey Pray, a spokesman for the Center for Initial Military Training, told The Army Times that the test in its current form is just a first step. "These will be used for testing 60 battalions throughout the Army over the next year," he said. "Final standards are not expected to be approved until October of 2019, and may be adjusted up until the test is approved for record on or about 1 October 2020."